A first-of-its-kind study released Thursday found that an alarming number of gay teens are homeless, with one in four gay students left alone on the streets. 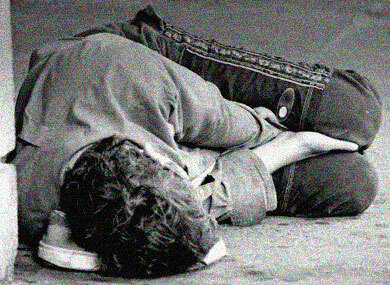 Gay youth are far more likely than their straight counterparts to be homeless, according to the Children's Hospital Boston study, whose author warns of "a serious problem requiring immediate attention." “These teens face enormous risks and all types of obstacles to succeeding in school and are in need of a great deal of assistance,” said Heather Corliss, whose findings show for the first time the magnitude of the homeless gay youth population. Corliss said these are "much higher numbers than we'd expect" given that gay youth are a minority. Less than 5% of the more than 6,000 high school students surveyed identified themselves as gay, lesbian, or bisexual. But those students accounted for 19% of the homeless. Among straight students, 3.2% were homeless. “This suggests that they may be more likely to be mistreated or rejected by their families and more likely to leave home,” Corliss concludes. Because the research was done only in Massachusetts, where gay marriage is legal and where researchers believe homosexuality might be more accepted, they warn it's possible that the rate of homelessness is actually higher in other parts of the country.